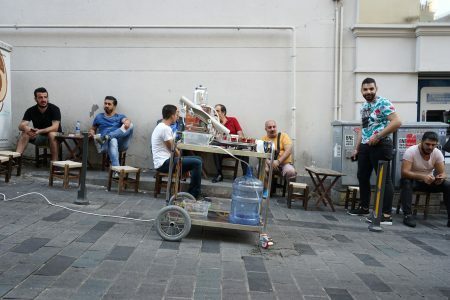 As part of A School of Schools, the 4th Istanbul Design Biennial, 0000000006 CWF, a prototype of a new robot, was created together with Batuhan Ateş from Acrome Robotics and in consultation with several tea makers in Beyoğlu. They showed us how they work and how important their social role besides making tea – as concierges, security guards, meeting points, knowledge exchange and a lot more – is in the community and discussed with us the automation of their labour and the challenges of it and what they could or couldn’t imagine to do in a post-labour life. Faruk, the fictional tea maker talking in the video, collaborates with his robot and is therefore more relaxed in the morning, spends more time chatting with the customers and realizes how his tea shop becomes more attractive to customers as it is the only place where you are served tea by a robot in Istanbul, for now. Besides realizing one new personal automation project it was interesting to test and discuss the concept of the Post-Labouratory with an example of social labour and in a different cultural and political context – in Istanbul where a lot of products are still crafted by hand, it seems unimaginable to automate especially the job of a tea maker and most people have a very different perspective on working culture, the job market and the future of labour compared to the dutch context where the project started originally.